I am noticing as of late the severe wearing of patient‘s teeth. This is mainly caused by grinding their teeth abnormally. Believe it or not a person’s upper and lower teeth should only come in to contact briefly during speech and eating and this is only for less than a second. Clenching or grinding one’s teeth together is a para-functiional behavior and needs addressing. The behavior of grinding can be manifested by STRESS, medications being taken, and possible “Iron Deficiency.” Exploring and understanding these causes is necessary to the treatment. A patient should have a space between their upper and lower jaws at rest, other than speaking or eating. 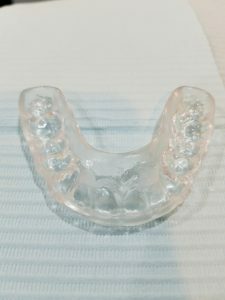 To clench and grind ones teeth will cause excessive wear and may cause significant damage, pain, bone loss, fracture of teeth, jaw joint issues and headaches. 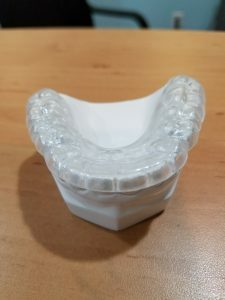 The guards are designed to retrain the patient to hold a space between their jaws; I like to use them along with educating the patient to be aware of the jaws at rest and to wean themselves from the constant use of the guards. If Stress is the cause for grinding the patient is to reapply the guards use during stress and again wean themselves from continual use. If, a grinding patient does not address the grinding issue this will cause great cost to them in re-building their collapsed bite. Crowns and Implants are very expensive the cost of the guard is minimal to restorations needed after damage caused by grinding. Some insurances will cover the guards cost, because they understand the savings in the longterm. The fabrication of the guard takes 10 minutes in the chair for an impression of the upper teeth and a day of lab work to complete the custom guard.